TENNIS TRAINING BY YOURSELF – Tie the ball to the base by rubber band, no need to pick up the balls frequently. TENNIS WIDE APPLICABILITY – Perfect for beach cricket, good practice tool for beginner, intermediate and elite players, but also a good treat for dogs. 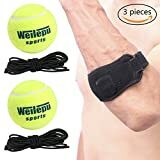 GREAT PROTECTION FOR YOUR ELBOWS – Can be used for tennis elbow, golfer’s elbow, computer or mouse elbow, rower’s elbow, fishing elbow, pool or billiard elbow. A SIZE FITS ALL – can be used on the left or right forearm. Can complement or replace elbow compression sleeves. Works great for women and men thanks to the adjustable strap. Fits almost all size or money back. HIGH QUALITY DURABLE GUARANTEED – Profession rubber and woolen tennis + Abrasion Resistance tennis Elbow. Designed for tennis,Improve the tennis skill but reduce the elbow pain. Tennis ball with string perfect for beach cricket, tennis practice and also a good treat for the dogs. Racquetball, Badminton, Squash, Football, Volleyball, Martial Arts, Hiking, Fishing, Rowing, Pool, Billiard, repetitive stress motion injuries, extensive computer mouse usage.